it may seem like i haven't been doing much in the quilting department, but lately, it's all i feel like doing. i have 2.5 more weeks before my due date, and i think that my nesting instinct is exhibiting itself in the form of quilting. i could sit at my sewing machine all day, but alas my kids don't really like that. 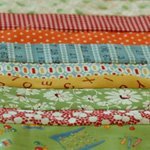 i joined the 9 patch quilt-along with amandajean...i did, but i didn't. i didn't do a square everyday, and i didn't do 70 squares. i of course made my quilt smaller, someday i hope to brave larger quilts, but this one is going to be a good lap size, good enough for me anyway. in a perfect world i can get this one basted in the next few days and quilted before the baby comes. i have also been working on this quilt, and should have the top finished today??? and another baby quilt, that i can't reveal just yet. Oh, I love this. 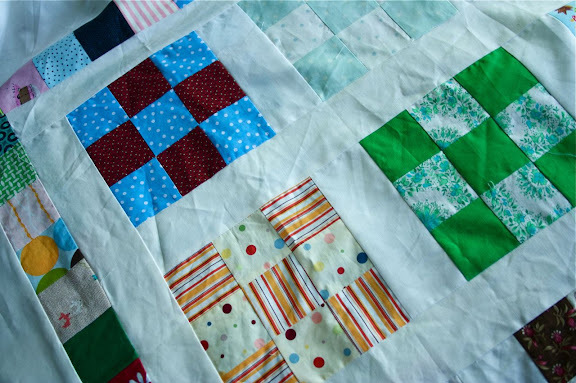 I love watching everyone's one-block-a-day quilts come together. I haven't started sashing my quilt yet. Maybe this weekend? I feel so accomplished getting the 70 blocks done that I want to stop and admire my work! I definitely meant to do the one-block-a-day quilt. Didn't even get started. This is going to be really cute. And I LOVE the blue and orange quilt with the stars. i'm excited to see the full reveal of the 9 patch quilt. and now i'm curious, did you go with blue blocks for the setting of the star quilt? Lovely collection of nine-patches. Looks like the perfect quilt for a baby roll around on. Nice job! Have fun with the whole mesting thing! Both those quilts are wonderful. I can't wait to see how you quilt them. It looks so nice! I started out small and worked my way up to bigger one. Love what I am seeing! Can't wait to see more. I love the colors in this. Can't wait to see the whole thing! you must be getting so excited! i remember that surge of energy right before the baby...enjoy and get lots done.